Of Yugoslavian parentage, Philippe Djokic emigrated to the US in 1952. He studied with Christine Dethier and Ivan Galamian at Juilliard, winning the school’s prestigious Fritz Kreisler Prize. He won first prize in the CBC Talent Festival in 1977, won the Marguerite Long-Jacques Thibault competition in Paris in 1975, the Sibelius Violin Competition in Helsinki in 1977, and was silver medallist at the Vaclav Huml Competition, Zagreb, in 1979, and the Paganini Competition, Genoa, in 1982. 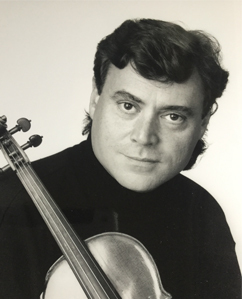 In 1975, Mr. Djokic joined the faculty of the department of music at Dalhousie University, where he was appointed professor of violin, conducted the Dalhousie Orchestra, and was in charge of orchestral training and chamber music performance. With the pianist William Tritt and ’cellist William Valleau, Philippe Djokic formed the Dalart Trio, which was heard on CBC broadcasts, and won the 1978 Chalmers Foundation Award. The Trio premièred Steve Tittle’s where there is no other (only we), and Clifford Ford’s Metamorphose. Djokic is active as a chamber musician, appearing regularly as half of the Djokic-Stodola duo with his wife, pianist Lynn Stodola, and with their daughter, ’cellist Denise Djokic, and son, violinist and CBC Great Canadian Dream finalist Mark Djokic. The Djokic-Stodola duo gave the first performance of Sonata 1985 by Oskar Morawetz and commissioned what finally matters most is grace by Steve Tittle. The duo performs at international music festivals, and has toured Europe and North America, inaugurating the Ottawa International Chamber Music Festival in 1994 and continuing to perform there annually. The duo also performs regularly at the Juneau Jazz and Classic Festivals in Juneau, Alaska. As a family, the Djokics have performed in the St Cecilia Society series in Halifax, and at the Indian River (PEI) and Ottawa festivals. Mr. Djokic has appeared as soloist at Wigmore Hall, London, and with orchestras in Europe and North America, appearing regularly at the Anchorage and Sitka festivals in Alaska, and the Park City International Chamber Music Festival in Utah. He has also performed at the Dubrovnik Music Festival in Yugoslavia. He served as Concertmaster of Symphony Nova Scotia and as a guest Concertmaster with the Toronto Symphony on its tour of northern Canada. In Canada, he has been guest soloist with the Toronto Symphony, Montréal Symphony Orchestra, Québec Symphony Orchestra, and Symphony Nova Scotia. His 1992 recording of the Delius Violin Concerto with Symphony Nova Scotia won a five-star rating from Music Magazine and international acclaim. He is on the faculty of Québec’s Domaine Forget Summer Music Institute. Mr. Djokic plays a Guarnerius violin made in 1740.